The glycerolipid profiling performed by Li and coworkers revealed small amounts of TAGs in cells of N. oculata IMET1 grown in Nitrogen sufficient media and the amount of TAGs was found to increase by about 3 folds when the cultures reached the end of the lag phase. In Nitrogen depleted cultures the amount of TAGs increased by approximately 400 folds in 96 hours after Nitrogen depletion and at the same time photosynthetic membrane lipids decreased significantly. Lipase-mediated membrane degradation is likely to channel FA from photosynthetic membranes to TAGs in Nitrogen depletion and indeed 14 of the 34 putative lipases identified in the genome, were up-regulated to some extent in Nitrogen scarcity. As previously observed by Simionato et al. 2013, however, the decrease of membrane lipids is not enough to account for the increase of TAGs and de novo biosynthesis of FA must take place in the cells in Nitrogen scarcity. Thanks to the new experimental evidence the author argue that the data suggest the presence of multiple sub-cellular compartments involved in FA and TAG biosynthesis and that the vast majority of the newly synthesised FAs are produced in the plastid through the de novo prokaryotic pathway. the coupling of TCA reactions with mitochondrial b-oxidation. 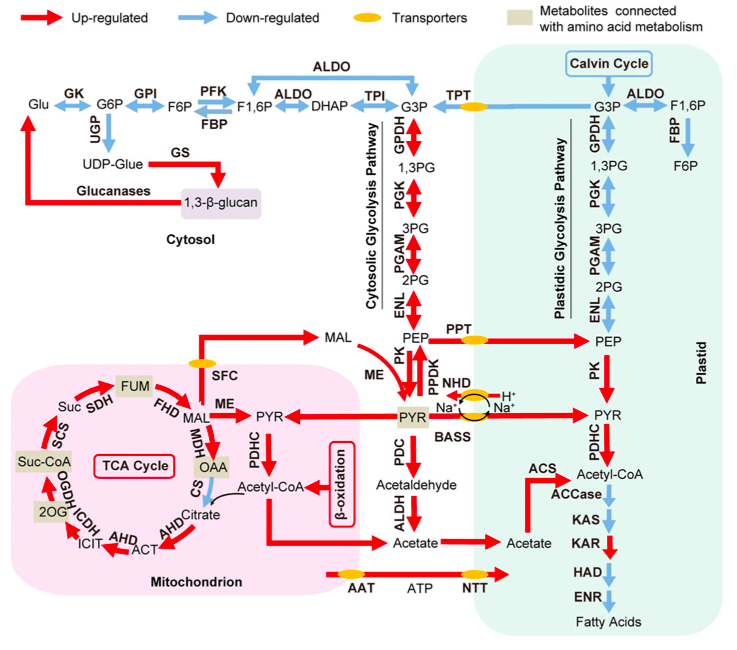 The authors observe that the increase of transcripts involved in carbohydrate and protein degradation along with the identification of genes encoding plastid and mitochondrial membrane transporters suggested a shunting of carbon precursors from carbohydrate and protein catabolism into FA synthesis and ultimately TAG synthesis under nitrogen deprivation. Finally, however, the authors suggest that, despite the increased production of FA during Nitrogen starvation, the regulatory step that determines the final TAG concentration in -N is actually the TAG assembly pathway. In oder words, under N depletion, it is the up-regulation of the transcript level of the key genes in TAG assembly, rather than those in FA biosynthesis, that leads to accelerated TAG production. Moreover the progressive up-regulation of various DGAT in Nitrogen depletion is likely very important for the bulk of the TAGs formed in -N.
I hope that this post will prompt an active debate on the topic! Corteggiani Carpinelli E, Telatin A, Vitulo N, Forcato C, D’Angelo M, Schiavon R, Vezzi A, Giacometti GM, Morosinotto T, Valle G. “Chromosome scale genome assembly and transcriptome profiling of Nannochloropsis gaditana in nitrogen depletion.” Molecular Plant (2014) 7 (2): 323-335. doi: 10.1093/mp/sst120.